This review of a Madrid restaurant is a break from The Picky Glutton’s usual London-based coverage. Like the superb La Tasquita de Enfrente, Divina La Cocina (referred to as Divina from now on) is located on a little side street not far from the Gran Via thoroughfare. If you weren’t looking for it, then you would never stumble upon it by yourself. Unlike the tiny La Tasquita de Enfrente, Divina is noticeably larger, with room for a few dozen covers at least, but has a similarly eclectic menu. Interestingly the restaurant’s name literally means divine cuisine – a bold claim. The place was almost empty on my weekday evening visit (due to a football match between Real Madrid and Barcelona as I learned from my waiter) which allowed me to enjoy my meal in peace and quiet. Although uncluttered and modern, the rather bland beige decor struggles to leave an impression. The unusual musical soundtrack of Europop, dance, rave and techno courtesy of the waiter’s iPod was odd, although it was eventually switched to more sedate music when a few other diners trickled in later on during the evening. As expected, especially given the lack of rival attention-seekers, service was efficient if a touch cold and terse. 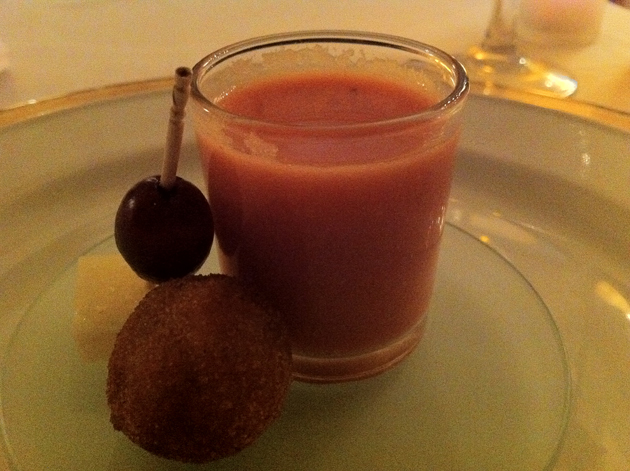 The unusual amuse bouche was essentially a virgin Bloody Mary made with carrots instead of tomatoes – the heat of the tabasco sauce and the tang of Worcestershire sauce was unmistakable. It was surprisingly good though with the tangy sweetness of tomato replaced effectively by the distinctly different sweetness of carrot. On the side was a grape and chunk of manchego cheese on a cocktail stick and a moreish sweet potato croquette that hadn’t lost its flavour through over frying. 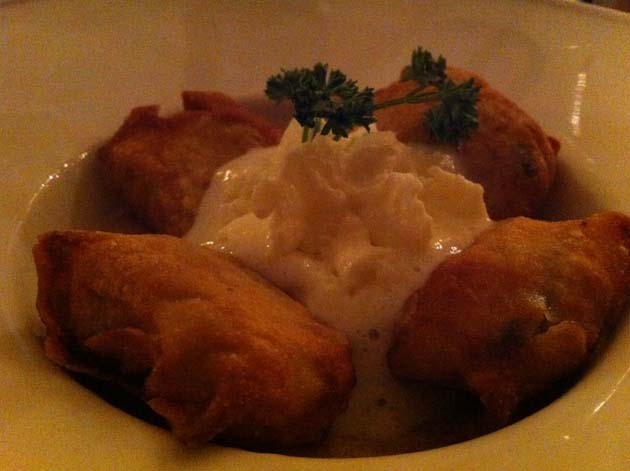 For my starter I opted for the prawn and lemon sole ravioli which, unexpectedly, arrived deep-fried. The crisp skins were surprisingly free of oil though and were of just the right thickness – not too thick and doughy, but not too thin so that the fillings were ready to burst out either. The salty prawn-filled ravioli tasted far more distinctive and interesting than the bland sole-filled ones and also went better the creamy mushroom sauce. A mixed bag, but not a bad effort at all. 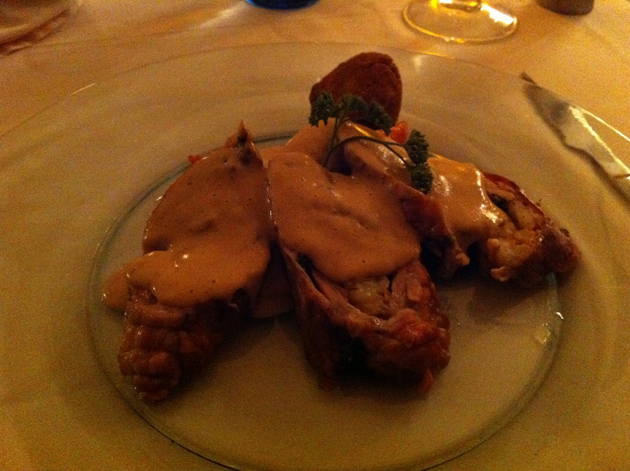 My main course was another odd combination involving prawns – this time a pair of sausage roll-lookalikes filled with a mixture of prawn and rabbit instead of sausage meat. The carrot and hazelnut sauce was very distinctive, but sadly the gamey taste of the rabbit was drowned out by the very salty prawns ultimately unbalancing the entire dish. If I was a cynic, I’d think that the excess of prawn was used as cheap filler to bulk out the dish. An interesting but ultimately flawed dish that fails to come together as a coherent whole. 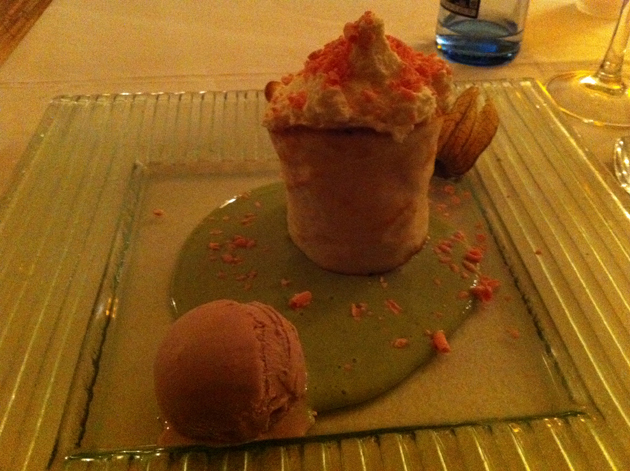 Dessert was a visually arresting white chocolate tower accompanied by ‘violet’ ice cream in a pool of basil sauce. The tower was actually a hard but buttery tasting hollow shell filled with a foamy white chocolate cream topped with strawberry flakes. The buttery shell seemed to be there to add bulk and substance. Despite its ephemeral nature and my general disdain for foams, the white chocolate foam successfully managed to capture the distinct flavour and sweetness of white chocolate, although the strawberry flakes tasted more like a strawberry-flavoured cereal bar or yogurt than actual fruit. The ‘violet’ ice cream was actually blueberry and was delightfully sweet and creamy, but the basil sauce, while effectively capturing the taste of the herb, seemed like an unnecessary addition which was out of place with the rest of the dessert. The kitchen at Divina La Cocina clearly has some interesting ideas, but some are clearly flawed while others are implemented clumsily. It’s by no means a bad place to eat – I would certainly rather dine here than at La Posada de la VIlla – but for skilfully executed modernist cuisine the admittedly much more expensive La Tasquita de Enfrente is a far better bet. Opening Hours: Monday-Thursday and Sunday 13.30-16.00 and 20.30-23.30. Friday and Saturday 13.30-16.00 and 20.30-00.30.